SUNCOS-WT product is a range of specialty polymers which are chemically modified derivatives of guar gum. 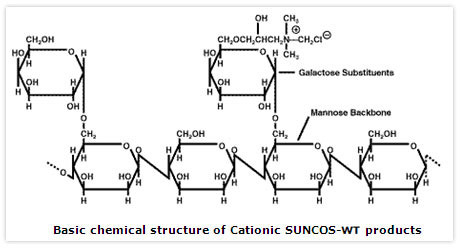 SUNCOS-WT products are cationic in nature and manufactured by reacting guar gum with a quaternary ammonium compound to obtain Guar hydroxypropyl trimonium chloride. Being cationic in nature, SUNCOS-WT products can be used effectively for the treatment of effluents having negative (anionic) charge on them. SUNCOS-WT products are natural biopolymer based flocculants and easily biodegradable, hence does not impose toxic effects in the system. SUNCOS-WT products with their very high molecular weights (long chains) and their varied ionic charge, fix the destabilized particles on their chain. Therefore the particle size in the aqueous phase will increase throughout the flocculation step with the formation of flocs. SUNCOS-WT products are available in varying viscosities, nitrogen content, particle charge density and dispersing properties. Customized products can also be provided to suit specific needs. Detailed specification sheets are available on request.